For the better part of six months, I’ve worn my Microsoft Band pretty much continuously. Except for a couple of times I forgot and left it charging, I have worn it from the first day it came out in November until a few weeks ago. Despite the extensive amount of additional information I have gathered since my initial experiences, my general impressions have not changed. The Band is a good product that is steadily improving. Some of the physical design issues, however, are worse than I originally thought. 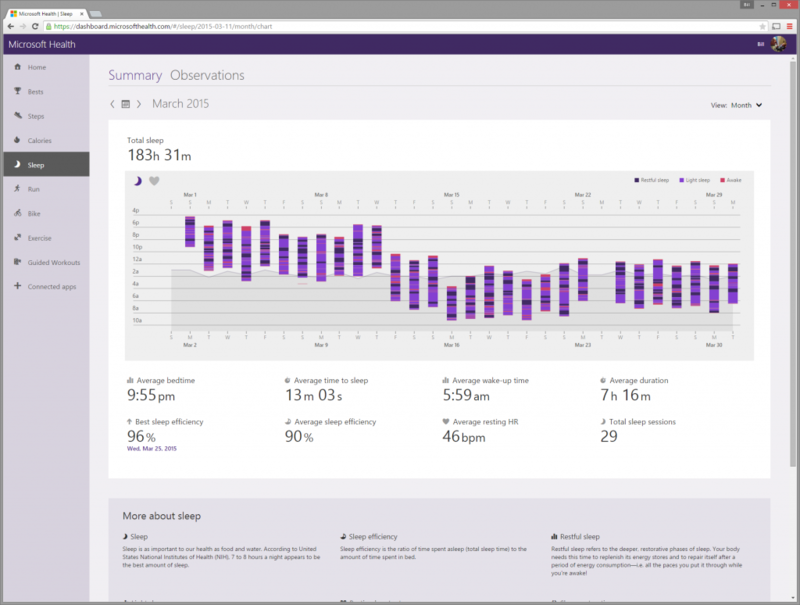 A screenshot of my sleep results for the month of March. The data improvements are good, but they’re not enough. I want to do more. I want to know about the trends. Do I sleep better or worse on Mondays? Is my sleep more restless when I go to bed late? I also want this data to tie in with data from other sources. Did my average heart rate rise as I gained weight (which I carefully measured with my Withings scale) over the holidays? Admittedly, none of the other monitoring smartwatches I’ve used offer these abilities yet either, but this is my dream. I plan to go into more detail about what you can learn from the data using a Band or other products in a future Tech Everywhere entry. As a cyclist, I am especially glad to see that the Band now has a bike mode similar to the one for running: Run (walk, hike, ride a bike…) with GPS. As this screenshot shows, the data is pretty good and is competitive with that of my bicycle-specific products. As with the run mode, the heart rate data is not as good as something like a dedicated Garmin unit with a heart-rate strap, but it is good enough for most casual cyclists or rides such as the one in the screenshot. (Really, I normally ride a lot faster!) 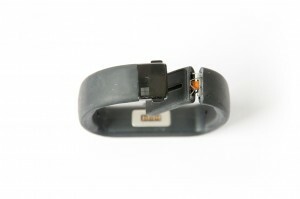 The main downside, however, is that when the GPS is on, the battery life drops dramatically. I’ve had the Band die on rides more than a couple hours long. 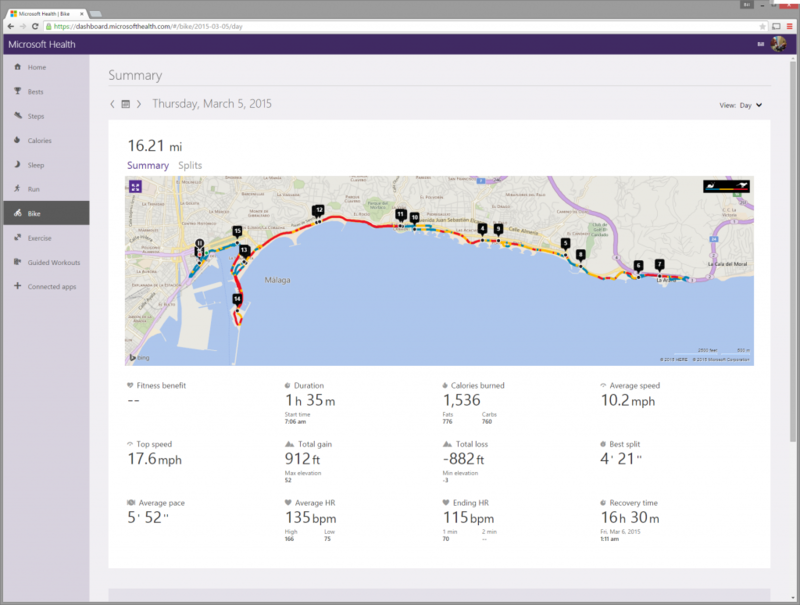 A screenshot of the information Microsoft Band supplies when I ride my bike. It still has more hassles than I’d like with Bluetooth pairing, though it seems like pairing is improving with each software/firmware update. Unfortunately, these problems are not unique to the Band. Look at the wear and tear on the Band after 3 months. As I stated at the beginning of this column, the big issue I have with the Microsoft Band is in the physical design itself. I could live with the fact that the thick band of the watch prevents me from buttoning my shirtsleeve. 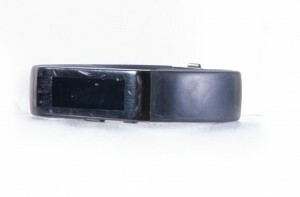 Over time, however, the beating from normal usage really took its toll on the Band. The glass was the first thing to show the wear and tear. This photo was taken after about 3 months of wearing it. After 5 months or so, however, the band quite literally fell apart. Other people I know have had similar issues. On the plus side, the folks at the Microsoft store replaced mine without any hassle. The Band fell apart after 5 months of constant wear. The bottom line is that I really like the Microsoft Band, but I think they need to work out the hardware issues. In other news, I’ve been wearing the Basis Peak since the demise of my Microsoft Band, and I’ll report on that soon. Also, my Apple Watch finally arrived, so I’m looking forward to trying it out. Finally, I expect the promised Pebble Time will arrive in another week or so. What this tells me is that I really need to start wearing a device on each wrist!